In a large skillet, cook sausage over medium heat until browned; remove and keep warm. In the same skillet, saute the onion in the sausage grease until tender then add the tomato sauce, chili powder and pepper. Stir together. 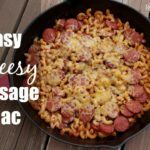 Add the macaroni and sausage; stir together and heat through. Sprinkle with cheese and cook until cheese has melted.